The latest camera sensors and post processing software can compensate for many mistakes we make in the field, but there remains one thing you must nail in the field – Focus. There are many tips out there to achieve tack sharp focus: put the camera on a tripod, shoot in live mode, shoot with a cable release, and use manual focus. Yet some of us still wonder if there is more… and yes there is! In this post I will cover the concept of hyperfocal distance, and make it simple to understand and apply in the field. Just to make sure we are all on the same page, Depth of Field or Effective Focus Range, refers to the distance between the nearest and farthest objects in the scene that will appear acceptably sharp in an image. large apertures = small f-stop number = shallow (short) depth of field. Generally this is fact, but actually lens sharpness falls off at the extreme ends. Image quality is affected when the aperture is closed down (towards f/22) due to light diffracting around the aperture blades. Therefore a more useful understanding of sharpness is that the middle apertures are ideal. On any given lens I try to shoot between f/8.0 and f/11 if I’m trying to get the whole scene tack sharp. There are times where I will stretch that to f/16 but anything farther than that I expect to lose sharpness. That still leaves us photographers with the decision of what to set the manual focus to, since lenses can only be set to focus on a single precise distance. Sharpness falls off gradually from the selected focus distance in both directions (near and far, unevenly) so more than just objects at that distance can be acceptably sharp. 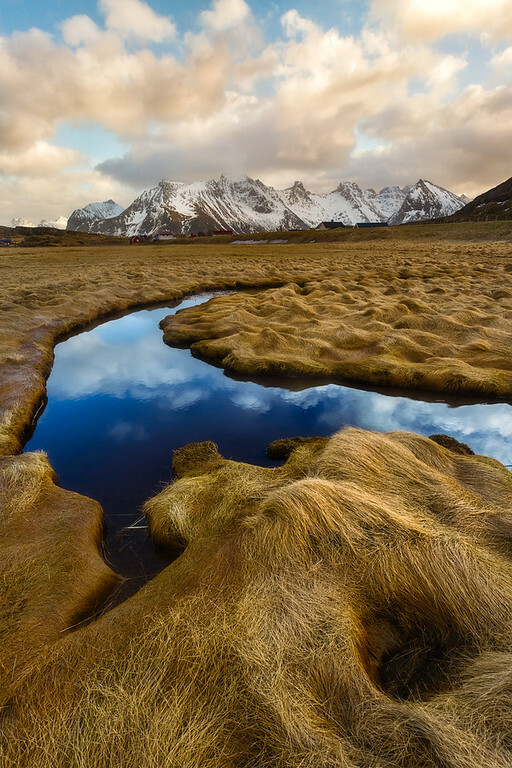 For landscape photographers, often the goal is to create an image that has tack sharp detail in the foreground all the way to the distant background. What is the best strategy to achieve that? The key to understanding where to target the manual focus is an optical quality called the hyperfocal distance. For a given focal length and aperture, there is a corresponding hyperfocal distance. When the lens is focused at this distance the maximum depth of field is achieved. The effective depth of field at the hyperfocal distance ranges from half the hyperfocal distance to infinity. For example: At 16mm & f/8 the hyperfocal distance is 3.5 feet (this applies to any lens at 16mm). If you were to focus on say a rock that was 3.5 feet away from the front of the lens, then all objects 1.75 feet to infinity would be acceptably sharp. One interesting thing to note here is that if you focus closer than the hyperfocal distance than your depth of field will be cut short, not extending to infinity. 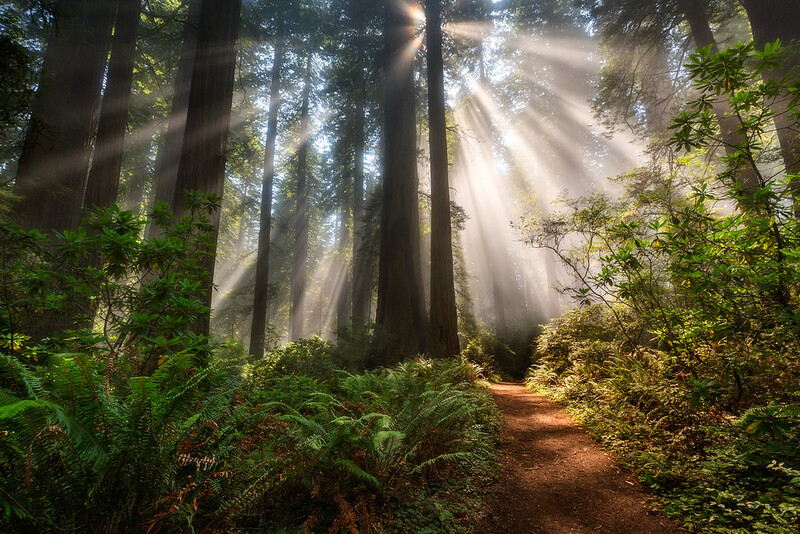 Continuing the example above, if you focused to 3 feet, your depth of field would be from 1.82 feet to 21.02 feet. If you focused beyond the hyperfocal distance you will still achieve focus out to infinity. Focusing at 4 feet results in a depth of field from 1.87 feet to infinity. Even focusing at 8 feet results in a depth of field from 2.43 feet to infinity. This means that a safe strategy is to focus a bit beyond the hyperfocal distance. Another way of thinking about it, is that the hyperfocal distance is the closest you can focus before you lose infinity. The screen shots you see above are taken from the “Depth of Field Calculator” app for the iPhone. I highly recommend this one because it allows you to visualize the range quite clearly. 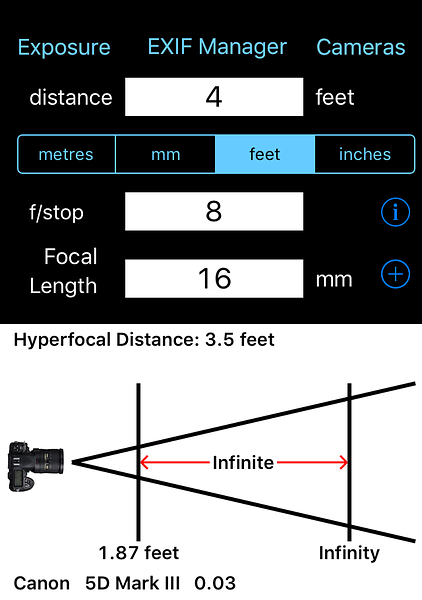 This app (and nearly any other app) allows you to select your camera which will account for crop factor multipliers. Alternatively you can use this depth of field calculator on the web to try out some focal length and aperture combinations. – Note that the markings on the lens indicating focus distances are not precise enough to use as a guide. – Wide-angle focal lengths will allow you to achieve maximum depth of field on closer objects than a telephoto lens. If you happen to use a telephoto lens to focus on something quite close, your focus distance will be less than the hyperfocal distance and therefore your depth of field will be fairly short (this is also the reason why it is easier to create bokeh with telephoto lenses than with ultra wide angles lenses). – Hyperfocal distance is only determined by focal length & aperture. – Depth of field is effected by focal length, aperture, AND focus distance. – It helps to memorize some focal length and aperture combinations that you use often so that you can be confident in the field you are getting a deep depth of field. – Target your focus slightly farther than the hyperfocal distance to make sure you get a depth of field that includes infinity. Extending the focus distance past the hyperfocal distance will only lose a couple of inches of depth of field on the near side. Focusing closer than the hyperfocal distance could drastically reduce your depth of field and disastrously blur distance objects. – “Acceptably in focus” is a subjective term and you may be someone who desires incredibly sharp photos (like myself). Since focus falls off gradually from the focus point, this means that the depth of field given by the calculator is too loose. Using the DoFViewer app you can configure a tighter requirement for focus, and you will notice that the hyperfocal distance gets pushed farther out for each focal length and aperture combination. Wait, How Do You Get Objects That Are Super Close In Focus? I’m sure you have seen those images that are tack sharp from front to back, but also include an object that is extremely close to the lens. Now that you understand hyperfocal distance, you know that objects closer than a couple feet won’t be in focus if you want to focus to infinity. This problem is solved by a technique called focus stacking where several shots are taken at varying focus distances (more are needed at the near end) to get the very close objects sharp. The images are then combined and blended in post processing. The photo at the top of this post and also the photo below, both required focus stacking to achieve the depth of field that you see in the final image. In both images, the nearest object was not extremely close to my camera, so I only needed a couple of shots to cover the entire range. However, it is not uncommon for some shots with extremely near objects to require 7 or more focus stacked photos. If you found this tutorial helpful please share it with others! If you have any questions please email me or leave a comment! I cover this topic in depth during my workshops. Click to learn more about my teaching & instruction.